I’m back home from a much-needed quick trip to San Francisco with Josh, and I cannot wait for us to visit again. We had the most incredible time, I feel like traveling as a couple is so rewarding. We get to visit a new place together and traveling allows for the quality time we miss out on during the busy work-week. We did so much in the 1.5 days we were away that I just had to share our trip and tips. When we arrived on Friday, we went to dinner and then had our own little pub crawl at the bars in North Shore. We had a couple of drinks and danced to a live band and 80’s music at Tupelo and Maggie MGarry’s. Dancing the night away with my hubby was definitely a highlight of the trip! This Wonder of the Modern World is so majestic to admire! The Golden Gate Bridge connects San Francisco to San Mateo and it is mighty and beautiful! We caught glimpse of the bridge on a light foggy day, which to my opinion made the landscape of the bridge even prettier. I was astonished by the fact that this bridge was built in the late 1930’s, the architecture is so advanced for its time, and some even thought the project would not be completed! Fishermans Wharf had the most authentic British Fish & Chips I’ve ever had! Check them out on Yelp, they have thousands of reviews! The Hot Fudge sundae from Ghiradelli Square (also located on Fishermans Wharf) was also a win! Besides the delicious food, there are a lot of vendors and art to explore. This place was so rad. The Ferry Building, the second busiest transit terminal in the world during the 1930’s is now a food hall with lots of delicious restaurants! I can only imagine how busy it must have been! Now, it’s busy with hungry tourists. Josh and I enjoyed a sunny afternoon and a couple of beers at one of the breweries on the outer part of the building, and it was literally perfect. The breathtaking view up here was worth the twenty minutes of uphill walking! My thighs still burn but the experience cannot be beat! Top Of The Mark is a gorgeous restaurant at the top of the Mark Building in Downtown San Francisco. We enjoyed the beautiful view of San Fran with a few drinks and Josh’s favorite, Jamon Serrano paired with Monchego cheese. Although, I didn’t get to ride a cable car, I could not leave them out of my post. There are so many of these rolling up and down the hills of San Fran! We even saw one filled with a wedding party, how rad is that and how beautiful are those wedding pictures going to turn out? I didn’t get a picture of the wedding crew because I was too busy trying to not lose my breath by walking up the hill, but I did get this pic. I just love the classic architecture of this city. Another highlight of the trip was how good we ate, from Fish and Chips at The Codmother to dinner at Frances; the food in San Francisco did not dissapoint! 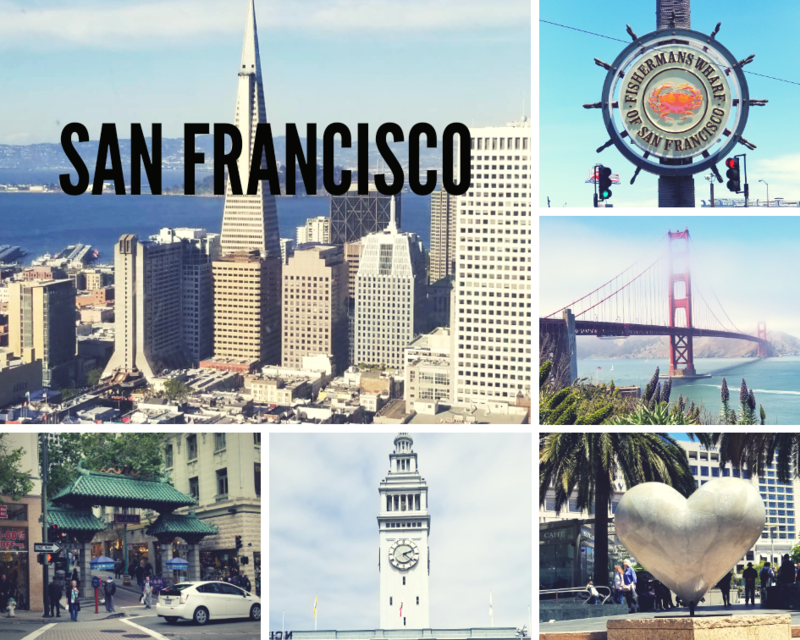 These are the restaurants we visited while in SF, and I highly recommend all of them! Frances: If you ever visit this wonderful establishment you should definitely order the Applewood Smoked Bacon Beignets (to die for!) We also ordered the Baby Spinach Salad, which is tossed in a delicious smoke yogurt dressing, the Duck Sausage Pappardelle (also amazing) and the Alaskan Halibut. All of our meals were so satisfying! Can I fly back now? Chinatown Restaurant: This was the first restaurant we went to on Saturday. We sat in a cute balcony table for about an hour or so enjoying conversation, really good Chinese food and people watching. Their Dumplings and Egg Soup were the bomb. The Lychee cocktail not so much, next time I’m sticking to beer. La Mar Cebicheria: We stopped in here after visiting the Ferry Building for a quick bit. We had Pisco Sours, their delicious Peruvian Beef Empanadas and the infamous Peruvian Cebiche. This place was definitely approved by this Peruvian. Fish on the Cod: Be careful not to burn your mouth! These suckers come out hot! Taqueria Leon: This place isn’t in San Francisco, it’s actually in San Bruno but I feel like it deserves an honorary mention. I had a sampler of 4 different tacos: carnitas, chorizo, asada, and al pastor; the tortillas were so soft, delicious and spongy, meanwhile the meats were so perfectly made. We also tried their churros, and yep the best churros we’ve ever had! There’s so much to do in this beautiful city! I can’t wait to go back to San Francisco soon. But for now, I’m happy to be home snuggling with my little family (Josh, Halley and dog-niece, Nora). On your next visit you must try BiRite creamery for the ice cream and the GG Park. It’s beautiful!